Midvalley Megamall, the shopping haunt for shoppers and families especially on weekends, while weekdays it's crowded with both shoppers and office workers in the vicinity. I've passed by this Blu Med Restaurant & Bar a few times previously, but did not really find the opportunity to dine there until last week. Read up below on my review of some of the new dishes whipped up by the chef from Blu Med for us. Blu Med, nestled amidst the bustling center of Boulevard Mid Valley, presents a perfect destination for both casual and more formal dining around town. Divided into two separate levels, the restaurant features a trendy cool and modern environment with touches of comfort on the lower floor and luxury on the upper floor. Entering Blu Med, I was greeted by an imposing floor to ceiling wall of candles separating the bar and the restaurant area, and a very high vertical garden complete with two chandeliers made of glass bottles. The ambiance is pretty nice, with a casual dining area that can accommodate up to 160 diners, and upper floor seating of 60. A welcoming drink of sorts, I was served with Blu Med's Strawberry Caipiroska while waiting for the appetizers to arrive. With generous amount of Absolut Kurant thrown in, with lime chunks, golden brown sugar, soda water, strawberry puree and lime juice, the drink itself had a pretty strong taste, but did whet my appetite for the food to come. Ah, a plate full of veggies, healthy choice indeed for an appetizer. The Steamed Vegetables dish is basically mixed salad served in lots of cheesy goodness (blue cheese and Parmesan cheese) with cream sauce, carrot, broccoli, cauliflower, potato and toasted garlic bread. If you love cheese, yet want a platter of healthy vegetables, then this starter dish will fit your tastebuds. The Eggplant Siciliana came served in this rather small-ish bowl, but for RM5, this dish is really worth the money spent. We had these small pieces of baked eggplant with tomato sauce mixed with capers, anchovies, olive oil and garlic. With the sourish taste from the tomato sauce, this dish will whet your appetite for the mains to come. I love soft shell crabs, and this dish, the Soft Shell Crab & Broccoli Tempura was one of my favourite, being part of Blu Med's Tapas menu. Have you seen or tasted a broccoli tempura before? Personally this is the first time, and surprisingly it turned out great! The broccoli retained it's juiciness without being over done and dry, even though the outer coating of the tempura was deep fried to a crisp. Good stuff here. Another very cheesy offering, the Quarto Formaggi Pizza was yet another first for me. Sweet tasting cheesy pizza, with the sweetness coming from the honey provided, and the cheesiness from the 4 types of cheese: blue cheese, mozzarella, taleggio, parmesa. Initially it tasted pretty funky, but the sweetness from the honey and sourishness from the cheese actually complemented each other well. Squid Ink Spaghetti, now I've tried some before in other restaurants, and they either end up being too oily, too 'fishy' or leaves too much squid ink residue on the tongue. Blu Med served us some rather nice Squid Ink Spaghetti minus all that, which is a good thing. Inside, it was filled with seafood, with clams, mussels, squids and cherry tomatoes. Blu Med's rather large Executive Combo Set came next, on a rather large platter, to be shared. I eyed the yummy satays the moment it arrived. The set consist of fried dory fish, chicken satay and chicken breast served with mashed potato salad. Not a bad choice if you want some variety in your meal, to be shared with friends. The dory fish was rather fresh, one of my favourite from this dish, including the satay. We ended with the delectable Caramel Apple Honey Toast with Ice Cream. It was sweet, with fluffy toast topped with caramel apple chunks, vanilla ice cream and cream. A befitting end to our feast, though I wished there had been more ice creams. 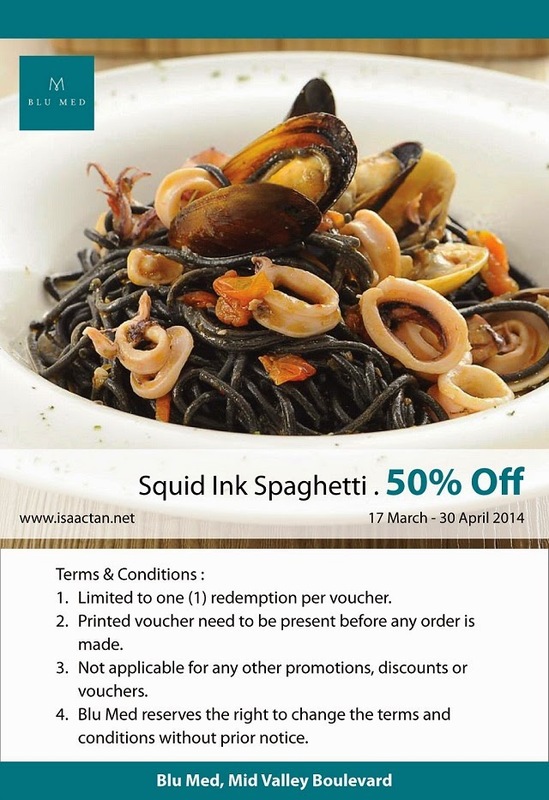 Get 50% off the Squid Ink Spaghetti when you print this out and show Blu Med! Overall it was a pretty good meal, with the new menu dishes offered by Blu Med tasting much to my liking. So if you're in the vicinity of Midvalley Megamall, do remember to check out Blu Med Restaurant & Bar. You could also check out their website too at http://www.blumed.com.my . I leave you with a sweet voucher of 50% off the price of the Squid Ink Spaghetti, so just remember to print out the coupon above if you wish to try it out! great deal, too bad its a little far, if not i will definitely redeem that voucher! great shots on the food Isaac! nice place that I plan to visit but no chance yet.. hardly go to Mid Valley nowadays, even if I go it will be just for movie. lol shall make it for dinner next time!